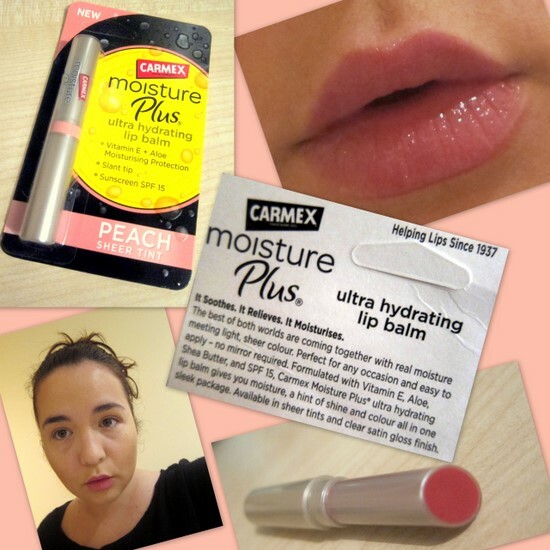 Carmex Moisture Plus Review, and Send a Virtual Carmex Kiss this February 14th! Tinted lip balms can be so-so, both in terms of colour and in keeping your lips soft and hydrated. But this one, Carmex Moisture Plus, is a little gem of a product that imparts lasting moisture, sheer colour and subtle shine, all in one quick swipe. A slim silver coloured tube with a slant-tipped applicator, it comes in clear, Sheer Pink or Sheer Peach, which is the colour I was sent to try out. Two new shades, Sheer Berry and Sheer Plum, have just been introduced. They all contain Vitamin E, Aloe, Shea Butter and SPF 15, to moisturise and protect the lips, and are priced at €5.99. This feels really lovely on the lips; it glides on smoothly and keeps them soft and moisturised. The peach colour looks quite strong in the tube but applies super sheer and naturally pretty, with just a hint of glossiness and shine. It tastes and smells of vanilla at first, before the trademark Carmex menthol taste comes through. The one negative is that I'm flying through this product! Partly because I'm using it almost daily, but also because the formula is very soft, so it just runs out quite quickly. And watch you don't push it up too far in the tube, because that same softness means it will easily break. But would I repurchase this product? Absolutely, and most likely in two or three colours, too. Carmex are also getting in on the Valentine's Day action this year: to celebrate, they've created a virtual kiss you can send to your sweetheart on February 14th. Log on to www.mycarmexkiss.com, choose one of four animated kisses and personalise with your favourite picture - your creation will be delivered by email. Carmex Plus is available from chemists and selected grocery shops nationwide, priced at €5.99. I'm a dedicated Carmex user so needless to say I'm very excited about trying this product out! Great find! This looks gorgeous on you, I too shall be adding to my lip balm stash now! Looks lovely on you will def be picking this up! I am permanently in need of Carmex in the winter. My skin gets so dry, and it really affects my lips. This looks fab, I'm a totally lip balm/gloss junkie so I'm always looking for the next best thing. I really like the color and look of this one. oooh this looks lovely - may well have to give this a try !! i am a hoarder of chapsticks and i think i'll have to add this one to the list! Love the hint of colour, gorgeous!